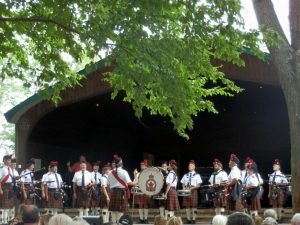 Thank you to everyone who attended this year’s Uxbridge Scottish Festival. While we did have some inclement weather throughout the day, it was another successful year! We were very fortunate to have the help of some amazing volunteers, without whom we could not have pulled this off. A big thank you to our bands who put on a spectacular show. To all of our competitors in the Highland Dance Competition, you were all winners! Such grace and athleticism. It was a wonderful celebration of traditional dance. The Tea Garden, new this year, was a lovely spot to take in the sights and sounds at the Festival. We received wonderful feedback on this new addition to the Festival. We will carry this momentum into 2019 as we plan for the next Festival. We hope you will save the date and join us as we gather to celebrate all things Scottish at Elgin Park in 2019. We will update this site with updates as they become available, so please be sure to bookmark the site and check back in with us. Our 2018 Sponsors are listed below. We encourage you all to support these fine businesses. Their support and generosity is greatly appreciated and allows us to continue to offer families the opportunity to enjoy our one-day Festival for free! If you would like to become a sponsor, please visit our Sponsorship page for all the details. There are four levels of sponsorship participation. Stewart Morrison Insurance is a a family owned insurance brokerage having been in operation since 1971, with offices conveniently located throughout the Kawarthas and Durham Region. Their corporate head office is located in Lindsay, Ontario with branch offices in the communities of Port Perry, Fenelon Falls, Peterborough, and Bobcaygeon to serve you. The Uxbridge Scottish Festival would like to thank Stewart Morrison Insurance for their generous contribution to this year’s Festival. Your support is greatly appreciated. If you’re looking for the best of British, Scottish, Celtic, English, Irish, Welsh, Masonic, & Guinness products, then you’re in the right place. From giftware, Celtic jewellery, clothing, custom kilts and kilt rentals, to authentic themed merchandise such from hit shows such as Game of Thrones, Outlander and Harry Potter. The grocery aisle is always stocked full of your favourite treats! A big thank you to The Wee Tartan Shop for your ongoing support and commitment to the Uxbridge Scottish Festival.